Fifty-three years after New American Library published the US English edition of Alexander Eliot’s novel Love Play in 1966, publisher Rowohlt Repertoire releases a new German language edition. As Alexander described it, this “… big, fat, lewd, philosophic work of fiction, pure and impure; a free-for-all, with Rabelais as a referee.” is now available to delight our German speaking friends. 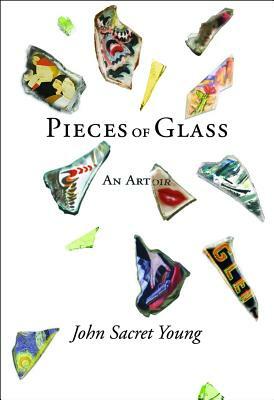 Author Alexander Eliot is featured in a new book, Pieces of Glass: An Artoire, by award-winning Hollywood screenwriter & author, John Sacret Young. Mr. Young devotes an entire chapter, A Rainy Night, to a chance encounter with Alex. Their talk is mostly about artists Alex met over the years during his tenure as Art Editor of Time magazine and later, in particular, artist Charles Burchfield. A mission certainly made more difficult due to the political leanings of Time owner, Henry Luce. Purchase Pieces of Glass: An Artoire. Because it was Beautiful – Now Available on Amazon! Tomorrow Alex would have been 97 years old … and we are delighted to let you know that the memoir he worked on for the last decade of his life is now published! It’s called “Because it was Beautiful” and now available on Amazon. Alex had the great good fortune to encounter an extraordinary wealth of people during his life, artists like Salvador Dali and Pablo Picasso, musicians like Benny Goodman, spiritual leaders like Masao Abe, the photographer Diane Arbus, and many others, some famous and some not, some he knew intimately, and some who were passing acquaintances. He writes about them with wit and wisdom and that marvelous story-telling gift that those of you who knew him personally will remember well. During this past year, since Alex’s death last April, many people have asked me about his memoir and wondered when it would be published. We are so glad to be able to announce this publication as a marvelous birthday celebration, a gift to all of us, one that shares the story of the life of an extraordinary human being. If you’d like to keep in touch with updates and information, please let us know. We do intend to publish this in e-book format soon and can let you know when that will be available if you wish. We welcome your comments, feedback, and friendship, for Alex’s sake as well as our own. Author Promote GloballyPosted on April 27, 2016 April 29, 2016 Categories Family, News, Writing1 Comment on Because it was Beautiful – Now Available on Amazon! Almost demoniacally, Freud penetrates a work of art. Malraux mingles it with his own anguish. Between these poles of promiscuity, Eliot’s moral attitude is original: Chastity; he loves art without violating her, he is intimate without so much as a touch. And just as Gala is in all my work, Eliot’s partner lives in his. Part Two. The family and friends of Alexander Eliot gathered on Tuesday, April 28th, at Figtree’s Cafe on the boardwalk in Venice, for a celebration of Alex’s life. The wonderful staff at the “Fig” graciously welcomed us to enjoy “the Alex” breakfast: a blueberry pancake and coffee. Alex and Jane went to the Fig every morning for breakfast for nearly 30 years, and after Jane’s death Alex continued the tradition. The cafe is a perfect place to honor him on what would have been his 96th birthday. This was not a formal service; it’s simply an occasion to commemorate the great man who meant so much to us. Video courtesy of Steven DePaola.